Intermediate Skill Level, Approx. 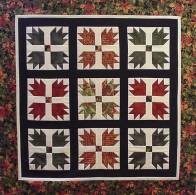 size: 35" X 35"
Fabric Requirements: Note: The quilt is made of 9 blocks, sashing, and 3 borders. 1. With one of the 5 fat-eighths fabrics and the background fabric, use your favorite technique to make 16 half square triangles that measure 1½” unfinished (1” finished). These form the “toes” of the bear paw block. 2. From the same fat-eighth fabric, cut 4 squares 2 ½” x 2 ½”. These form the “paws” of the bear paw block. 3. 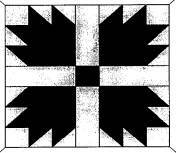 From the backgroun­­d fabric, cut four squares 1 ½”. 4. Also from background fabric cut 4 rectangles 1 ½” x 3 ½”. 5. From outer border, fabric, cut 1 square 1 ½”. Sewing Instructions: (For one block) Press in the direction of the arrows. 1. Using the 16 half-square triangles, sew two triangles together. Note direction of “toes”. Make 4 pairs facing right and make 4 pairs facing left.